When it comes to keeping your horse healthy, hoof care is often the critical element that allows you to enjoy normal activities with your horse, such as riding. Both shod and unshod, otherwise known as shoed or barefoot, philosophies offer benefits, but also come with limitations, which directly affect the health of the soles. While shoeing is necessary for many horses, a shod foot does not absorb shock as efficiently, mostly because shoeing raises the sole and frog off the ground, and constrains the normal flex of the foot. A lack of sufficient ground contact and stimulation limits circulation, which causes soles to shrink, which can lead to numerous problems. 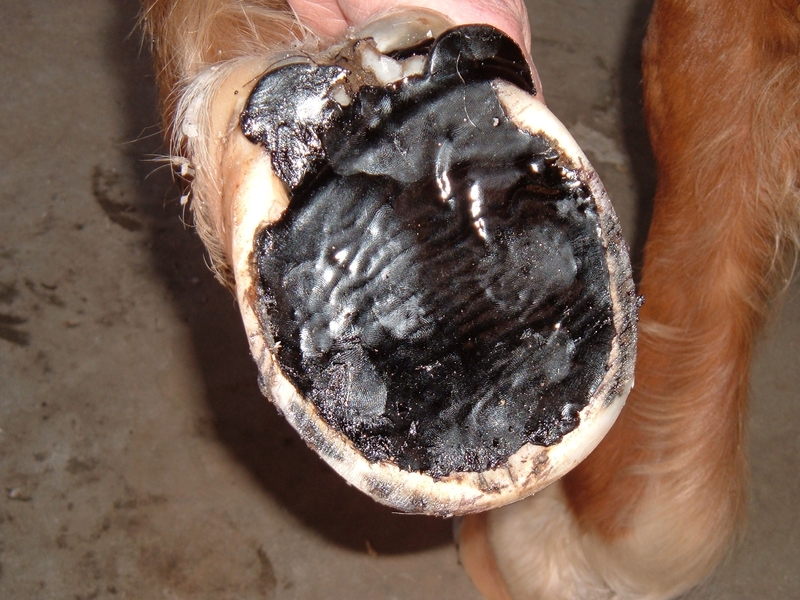 By contrast, an unshod foot uses the hoof wall, internal hoof cavity and sole to absorb and dissipate shock. However, adding the weight of the horse and a rider, can sometimes wear the hoof down faster than it grows. In these cases, shoes or boots can be a good short term alternative, as well as polyurethane pour-in pad materials to help limit sole wear and provide the necessary support. Trim Hooves and address shoe size on a regular schedule. Feet that go untrimmed longer than seven or eight weeks develop thin soles. In addition, when hooves are trimmed properly, it is likely shoes will fit better. When a shoe is applied, it’s important that the farrier addresses the toe fit, expansion and length of the shoe and assures it fits the feet correctly. Ask a farrier to use pour-in pads that adhere to the bottom of the foot. Pour-in pads are liquid urethane adhesives that provide durable, shock-absorbent support within the hoof capsule. Vettec Equi-Pak or Sole-Guard can be applied to the bottom of the horse’s foot to keep the sole engaged when shoes are applied. Equi-Pak and Sole-Guard are fast-setting, pad materials that bond directly to the sole and the internal hoof cavity, and improves the depth of the sole. These materials provide extra protection and support, and also bonds to the sole to protect it from abrasion so that soles can continue to grow. The adhesive immediately bonds to the sole, sealing out moisture and debris. Pour-in pad material can be filled to ground level for maximum support and effectively absorbs concussion, instead of sending it up the leg. A pour-in pad supports the bony column of the leg by loading the entire hoof area and positions the weight-bearing load over the entire ground surface, not just the hoof wall. Ask your farrier about if your horse needs more support in its internal hoof cavities, if the soles are thin and which pour-in pad materials are best for your horse. In Case You Missed It – March Trade Shows Recap!